The first church was built in Colborne in 1823 as a meeting place for the Wesleyan Methodist congregation. On April 15th, 1830, Joseph Keeler presented the Methodist Trustee Board with the deed for Lot 82 in the Village of Colborne and a new church was built in 1830/31. The first parsonage was at the North end of the lot, the church was in the middle facing West, and the cemetery was in the South section of the lot. In 1862 the present church was built out of bricks manufactured on Keeler’s property West of Colborne. 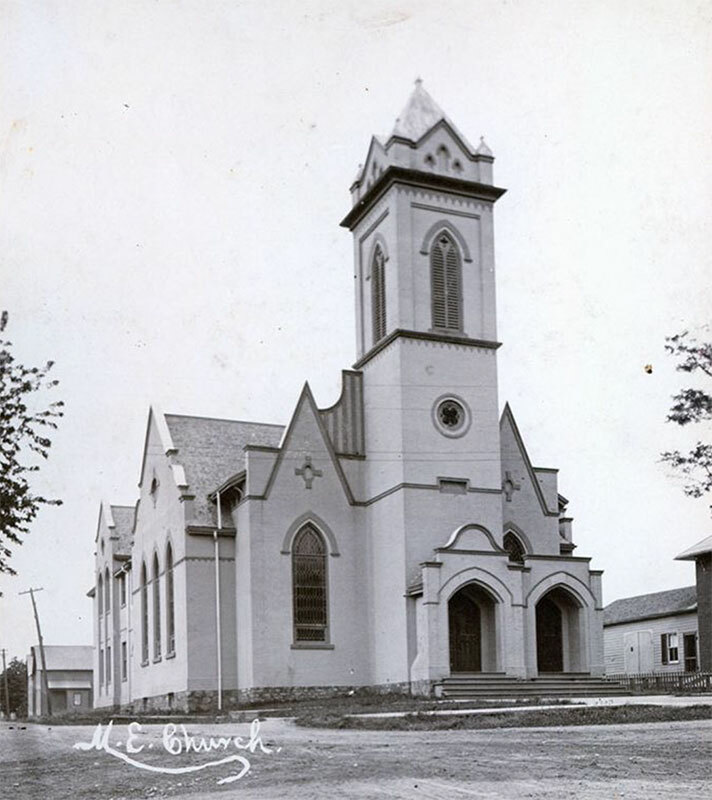 For some years after the new church was built, the old frame church was used as an exhibition hall by the Cramahe Agricultural Society. In 1889/90 the Sunday school and vestry were added to the north section of the church and at the same time, other alterations were done. In 1900/91, the building was again remodelled, by taking out the sides and gallery and widening the building. When this last renovation was completed the building no longer resembled the 1862 model. In 1889/90 Daniel Lewis Simmons ad his wife, Eliza Ann, presented the church with a pipe organ as a gift. The United church was created in 1925 when the various sections of the Methodist faith amalgamated. The church served the community until 2010 (?) when. Given its size, it is used for funerals and for other community functions.